May 15, 2015 was our farewell Side by Side Singing session hosted by Calvary Episcopal Church in Fletcher. The acoustics in the Parish Hall are wonderful — as were our hostesses who provided us with lovely refreshments at the end of each song session. 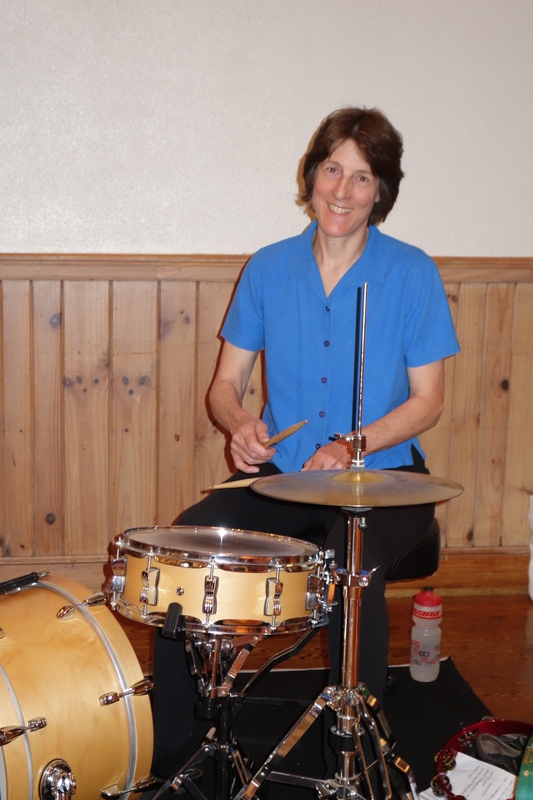 For our final session we ‘rocked out’ a little with Jane Snyder on the drums, Jan Mallindine on guitar, Ruthie Rosauer on clarinet and Debbie Nordeen on piano for “Swing Low, Sweet Chariot” and a few other songs. We also sang some slow ones! “Danny Boy” and “Always” were requested by the participants. And our perennial favorites “Side by Side,” “Sentimental Journey” and “Happy Trails” were not forgotten. As we bid a fond farewell to our Fletcher location, Debbie and I wish you Happy Trails until we meet again. Our next series will begin on Wednesday, July 15 at 1:30 at the Biltmore United Methodist Church on Highway 25, just south of where interstate 40 crosses Highway 25 (also known as Hendersonville Highway or Asheville Highway). 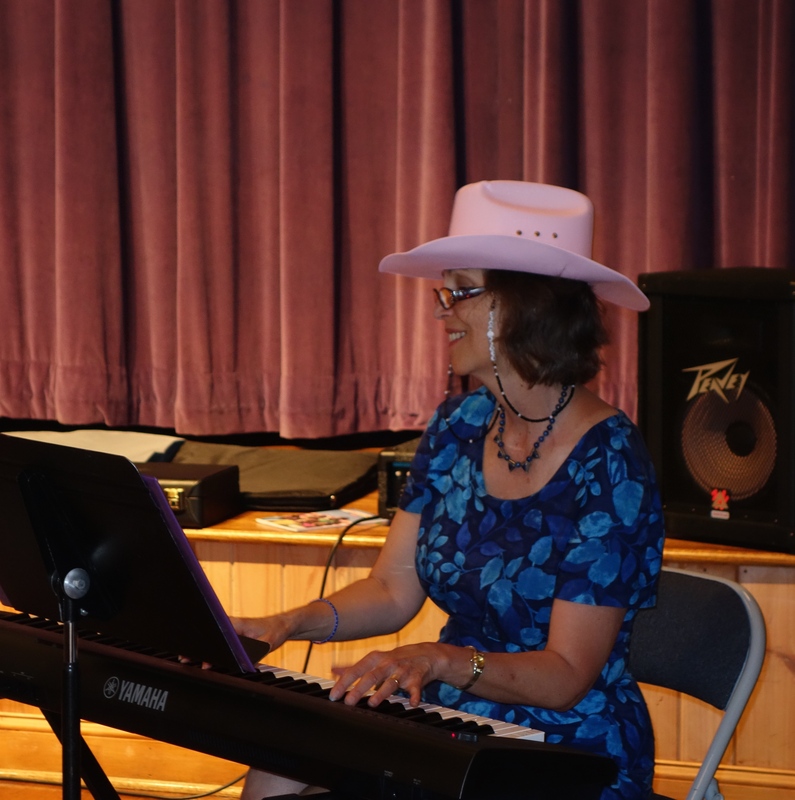 Debbie Nordeen, in pink hat, on piano. 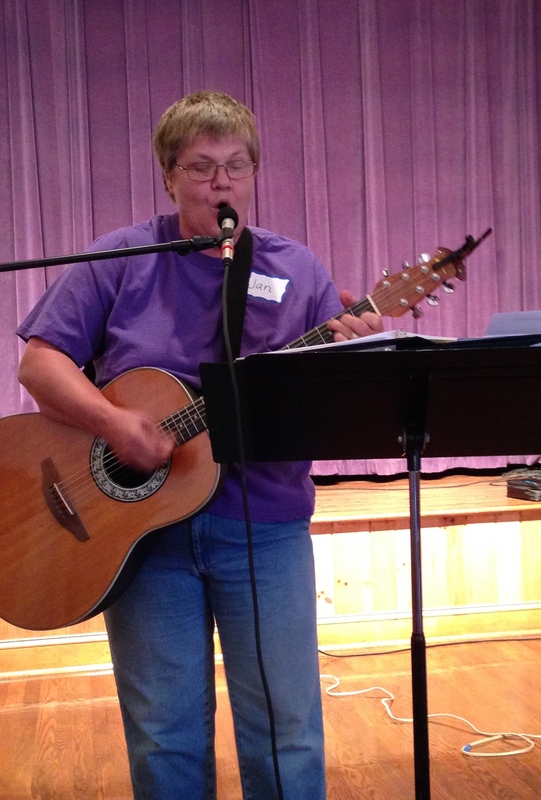 Jan Mallindine played the guitar for Side by Side Singing in Fletcher today. She’ll also be accompanying the group on her guitar for several numbers next Friday, May 8, 2015. 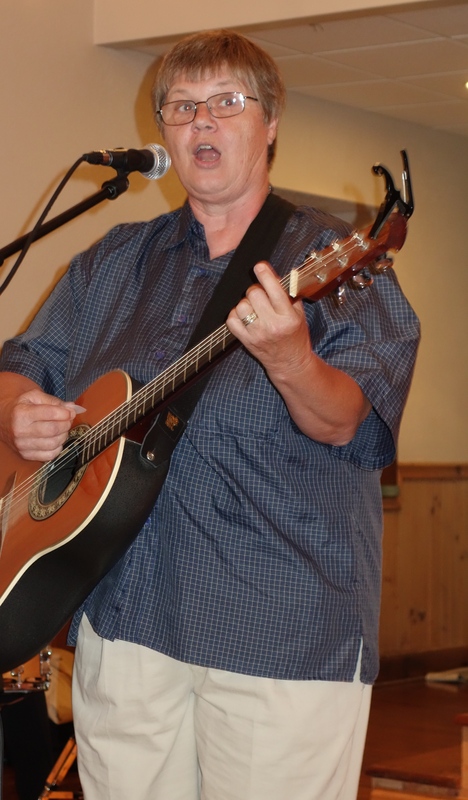 Jan has a wonderfully rich voice and excels in adding harmony lines to well-loved songs such as “This Land is Your Land.” Also next Friday Side by Side will be accompanied by Lyte Henrickson on the piano. Many of you who have sung with Side by Side already know — and love — Lyte’s song, “I Will Carry You.” We know you won’t want to miss next Friday when both Lyte and Jan will be joining us! Tell your friends! We sing at 2pm at the Calvary Episcopal Church on Highway 25 in Fletcher.